This is probably the strangest looking camera accessory out there, but I swear it is actually a legitimate accessory. It looks like something someone rigged up in their basement, but as long as it works it really doesn’t matter. 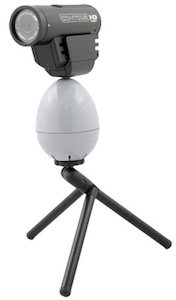 This strange little egg allows for you to record a full 360 degree view all with your very own camera. It won’t have any unsteady movements either thanks to the tripod that’s necessary to make this egg work properly. Just set up the Camalapse in between your camera and the tripod. Then you twist the egg around just like you would an egg timer. It can take 360 degree footage over the course of an hour. The stand is a little touchy about which cameras it can operate with, since it relies upon the camera to be completely balanced in order to function properly. Those that think that their camera will do just fine can purchase it for $24.99 through Camarush.